This 12 inch pizza mat will turn any sheet pan you have into a non-stick surface. No longer do you have to waste time and money on parchment paper, an expensive stone, spray, butter, grease, etc. 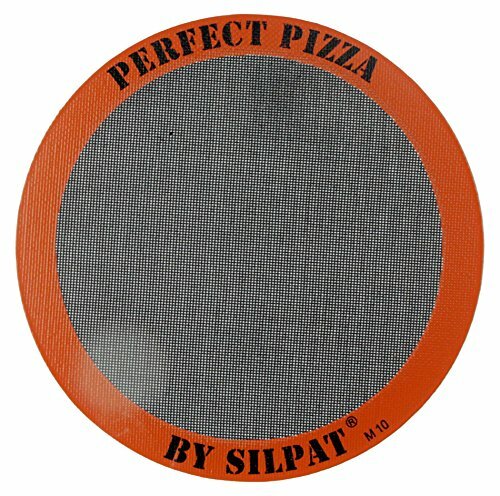 The Silpat perfect Pizza mat is perforated to allow for maximum heat circulation and an excellent bake. Crispy, crunchy pizza is as easy as one, two, three with the Silpat Perfect Pizza! Silpat's proprietary silicone and fiberglass mesh is our own formulations made in our factory. This is not a cheap industrial silicone that is present in other silicone products. Silpat is especially great for working with sticky materials such as gooey dough, taffy, caramel, or anything your imagination allows. This mat specifically is designed for baking pizza without the use of spray, grease, oil, parchment paper or a pizza stone. Nothing sticks to Silpat, so it will save you a lot of time cleaning as there is no more sticky mess on your pans! Silpat never needs greasing, which saves both time and money. Use Silpat instead for any baking recipe that calls for parchment paper. Utilizing Silpat products saves time, money and creates less waste for our environment. It is ideal for use when creating Danish pastries, baking biscuits, working with sugar and all sugary and salted preparations. Silpat non-stick mats are made of fiberglass and silicone, and can be used thousands of times. Life of Product varies-lasts 2, 000 to 3, 000 uses depending on use and care. Silpat products conform to us regulations on food grade silicone, and are FDA, NSF, and Kosher certified. Can be used at temperatures varying from -40 degrees C to 250 degrees C (-40 degrees F to 482 degrees F). Do not cut the Silpat as the fiberglass mesh particles might migrate into the food. Made in France. Silpat is known around the world as the original non-stick baking liner. Silpat liners are made of fiberglass and food grade silicone and are completely food safe. Nothing sticks to Silpat! If you have any questions about this product by Silpat, contact us by completing and submitting the form below. If you are looking for a specif part number, please include it with your message.